Fans of animation will definitely fall in love with the work of San Francisco artist Rachel McAlister. Her beautiful character designs and concept art are worth checking out. There’s lots to see on her website and blog so make sure to visit her sites after admiring this fantastic new piece she did just for PixArt. We are so grateful for her time on this wonderful piece. 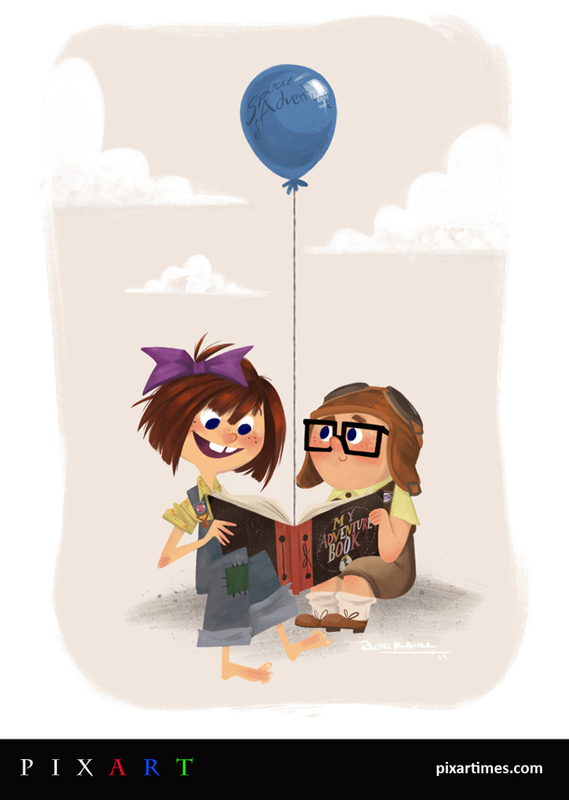 Carl and Ellie have never looked sweeter! My “official grown up portfolio site” is rachelmcalister.com, but my place where I post random doodles and the fun time nonsense art that I make is chuchuboogie.tumblr.com. St. Louis, Missouri – land of toasted ravioli, gooey butter cake, and an Arch that people are oddly fond of. But seriously, try the toasted ravioli if you stop by there. It’s delicious. Up! Besides being an AMAZING movie, it was released on my birthday and I took it as a personal birthday present to me. Thanks, Pixar. That is a tough decision. I think I’ll choose Remy (from Ratatouille) because he doesn’t let anything hold him back from his dream. But I have to note how much I love Mike Wazowski (from Monsters, Inc.), and Dug and Russell (from Up) as well. There are just so many great characters! The thing that immediately pulled me into Up and that I felt was the strongest part of the film was the love story between Ellie and Carl, even though it only lasted maybe 10 minutes. I wanted to do something that tried to capture the youthful beginnings of their relationship. I’d say never stop learning. If you have the opportunity take a class, or go to a place where you can sketch live models, or even just go outside and draw the people and the scenery around you. Everyone can still improve and learn and it’s important to push yourself to do that. If you are in an area that doesn’t offer a lot of formal face-to-face art classes, there are lots of online schools now that you can try. I personally have taken lots of classes from CGMA, which has been great. I don’t really have much to promote right now. I have a society6 page if you’d like to buy some prints from me at society6.com/rachelmcalister. Other than that, if you like my work please follow me on tumblr at chuchuboogie.tumblr.com. That’s what I keep most up to date, so if I have anything cool coming up it will be on there.